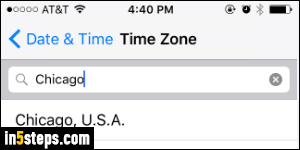 By default, your iPhone / iPad / iPod touch automatically get their time zone from your location. Only your iPhone comes with built-in GPS: the others "guess" your approximate location by triangulating two, ideally three, wireless signals in range (whether you're connected to one of them or not). 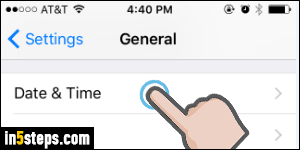 But if you are traveling, and want your device to show your time at home, iOS lets you turn off auto-updating of time zones, and manually choose the one you want. 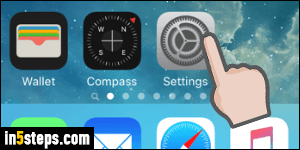 To switch to a different time zone, and prevent iOS from changing it, click on the Home button, and tap on the Settings button (gear icon). Scroll down to your General options (fifth group of settings), and tap on them. In the next screen, select your "Date and Time" settings. 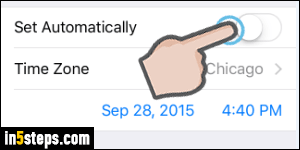 (Tip: the "24-Hour Time" toggle shown first is what lets you show military time on your iPhone / iPad!) 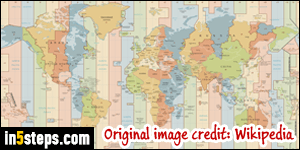 The last setting on that screen shows your current time zone, based on a major city in it (Central Time, as in Texas, shows "Chicago" as time zone).